What Do You Mean By ACTIVE CLIENT? To be an active client, Rover must not go over 6 months of inactivity (meaning no bookings for daycare or overnight). If Rover has been inactive for over a year, they will be removed from our system to allow for new or waiting list clients to book with us. We are not a 'drop in' facility, so we do require trials for all new clients before a booking, and reservations to be made in advance. This is to ensure we have a consistent and responsible group of clients for your dogs to mingle with. In 2013 - we did stop accepting new clients due to the demand and lack of space available. With moving in 2015 - we hope to provide more room for new clients, however due to our need for consistency and fairness to our active and loyal clients, we might hold off on accepting new clients during our busy seasons. What age does my dog have to be? We require all dogs to be at least the age of 3 months old, fully vaccinated for at least 2 weeks, before attendance at Sleep Rover. 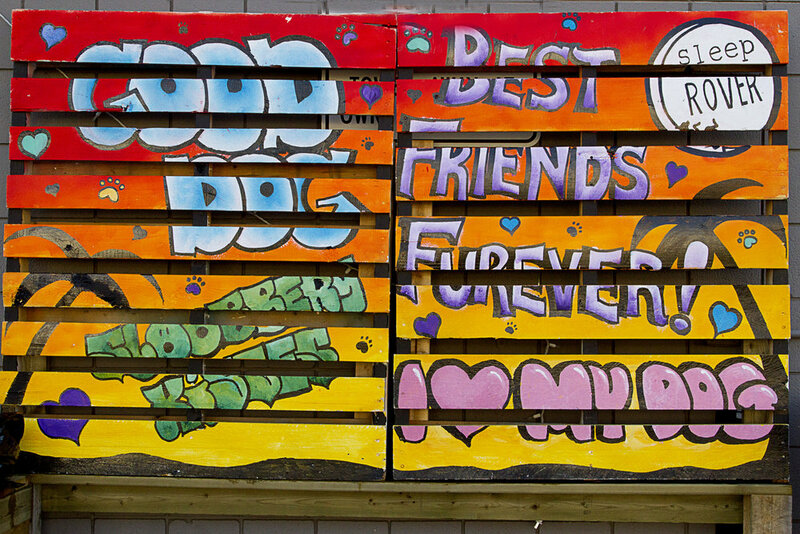 Due to our open concept nature, and surroundings with other dogs that frequent dog parks, training facilities etc. - we want to keep your new puppy safe and protected. WHAT DOES OPEN CONCEPT MEAN? Means our clients get free roam of their play rooms (just like at home or a childs daycare) inside, and OUT! Corbin, Clover, Claire & Cooper! Sleep Rover is set up like a “Home Away from Home” meaning our guests have free run of the facility. We have 6 rooms separated in size and energy level – the only restrictions. Dogs mingle and play together free and carefree like a child’s daycare. Our Layout allows for open interaction and stress free energy – and that includes our human caregivers. A quiet calm energy is important and you will find it is very quiet at Sleep Rover during the day. The loudest times are during check ins in the morning when everyone is raring to go AND during feeding time! We have a huge outside play ground (17,000 sq.ft.) for the dogs to release some steam and run and chase to their hearts content! No cold dark concrete cells or lonely crates for a stay, listening to their friends howling in sadness. Sleep Rover is a stress-free environment with lots of human interaction. Just like home! OF COURSE! Any kennel you go see, should allow you immediate tours during business hours. We do recommend coming between 11am to 2pm - when we are not dealing with checkins and outs (to which a wait time can be quite long) - however if you are in no rush to wait till all our checkins and outs are done - then please come! We allow tours during business hours only. We allow all breeds - we do not discriminate! It's not the dog, it is the human behind their leash. What can I expect after a stay at Sleep Rover? #sleeprovercoma - our clients created this hashtag for us many years ago. It is the main reason why clients use us! Dogs might be tired, or go straight to bed after a day at Sleep Rover. This is normal - just like you would, if you spent a whole day at the gym. They might be a little sore, if this is a concern, please do let us know, to limit their play time. If this is their first time at a dog kennel, you might encounter the dreadful dog flu. Like the human flu, with lots of liquids (such as homemade bone broth), some honey for their throat and lots of rest - they will create immunity to it, and possibly never get it again! Like any flu, if symptoms become drastically bad within 12 hours, seek vet attention immediately. With the added dust and fur of so many dogs, some dogs develop goopy eyes due to irritations. Sometimes some eye drops will rinse it clean and keep it moist. Same as above, any drastic changes need immediate attention to your vet. I am from Out of Town, Will You Take My Dog? If Rover currently attends an open concept facility in your City, and is up to date on shots, we will accept your dog during your travels! We simply need a letter of referral, your updated vet records and we are set to book them in. We have clients from as far as Montreal to clients that drive down from Edmonton for their vacation just to leave Rover with us! Why do my dogs have to be Crate Trained? With over 100 dogs to feed, we need to kennel all our clients during feeding time. It gives our clients space to eat and enjoy their food. It also helps us track who is eating and who is not, and MOST IMPORTANTLY, that they get an hour rest after eating to prevent bloat and any illness. Almost 90% of our clients are crate trained, and during feeding time is a quiet time for them to relax, and have their own space. You are more than welcome to request longer crate periods, including at lunch or even overnight. If not, our clients are in our open concept rooms most of the day. How do you feed the dogs? It is highly recommended that all Sleep Rover clients be kenneled trained! 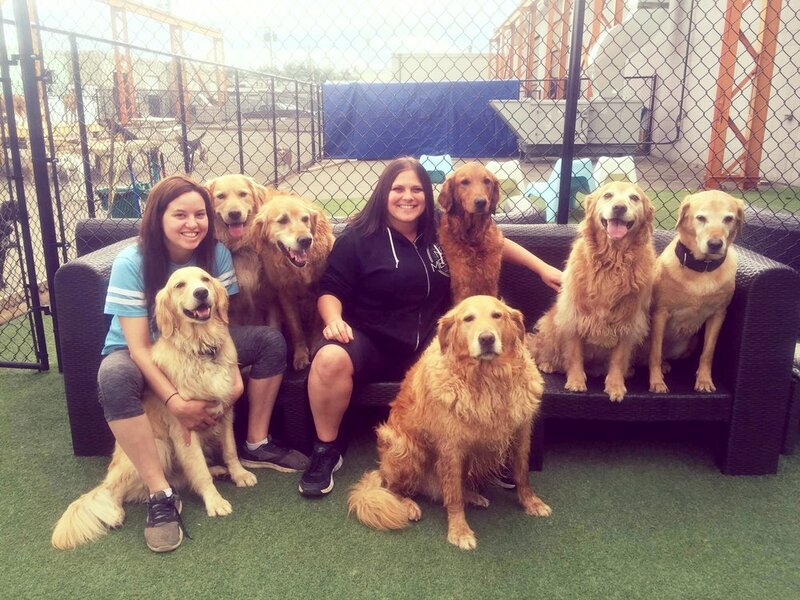 We feed all our clients in their own crates, and they are encouraged to stay in the kennel for at least an hour, to allow for digestion and to prevent vomit and puke from playing immediately after eating. This also allows us an ability to track who has eaten, and who has not. We do not feed breakfast for daycare dogs. WHY? Dogs come in super excited already, and do not seem to settle when they first get here. As our overnight clients are all crated by 6am for breakfast, we firstly do not want to disturb them, and secondly, they are all let out by 8am. If your dog did not eat breakfast, still bring their food, and we can feed at lunch. We have 3 feeding times - 6:00am to 7:00am for breakfast (that is why you hear dogs howling.. they are demanding breakfast!) - there is an option to feed lunch at Noon - and Dinner is started from 4pm to 6pm depending on how many dogs need to be catered to. Does my pet need to pass an assessment in order to be accepted at Sleep Rover? All clients at Sleep Rover require a trial day of daycare (complimentary) before any stay (whether daycare or overnight). We will know from experience if your dog is suitable for our environment. If immediate signs of aggression are present, you will be asked to pick up Rover while they are kenneled away from the other clients. Dogs that appear under stress and do not get better as the time persists, will be asked to venture other options such as house sitting or private dog kennels. You will receive a Trial Daycare card noting how Rover does. A ranking of 1 to 5, 1 meaning some attention is needed and 5 being all star, no problem! Do you allow unaltered dogs into Sleep Rover? Unfortunately due to the nature of dogs that are intact, we do not allow any intact dog over the age of 6 months old (pushing up to a year old) to attend Sleep Rover. We know sometimes plans change, so as long as you give us 48 hours notice – we do not have any penalties. Please read our Sleep Rover Cancellation Policy updated as of January 2013. For peak holiday times (all stat weekends running Friday to Monday), there is a non-refundable $120 charge at the time of booking with no refunds. Christmas Holidays have custom requirements for booking. Please inquire. What do I Bring to Rover's first Stay? Comfortable Collar with name tag if possible! Their own dog food (kibble, raw, dehydrated and canned are all acceptable, and available for purchase at our boutique)! Make sure to pack a few extra meals in case your flight is delayed!! Meds or Supplements - this is at no extra cost to you if we have to administer these items. Please just note their use and amounts at drop off. No need to bring any beds, toys or dishes as we have all that here. We use stainless steel bowls for sanitary cleaning and have our own beds from Bowsers and Molly Mutts that are cleaned daily and of course our own toys to destroy, instead of your own! Just so our clients are aware - we have parking on the north and east side of our building. 1. The north parking lot has a curb - as it is not deemed a parking lot. Our landlord had placed those in the past - so we are unable to put curbs in (as it is a roadway) - however the City has graciously granted us, for the duration of our tenancy - to use these spots. However watch out - the curb is super high. Go in sideways. 2. We also have a drive up area - we have 2 parking spots in front of the building by our door for 2 hour parking - but you can fit up to 4 cars on the drive up - if you plan to just pick up and drop off quickly! Just insure you do not park in front of cars that need to back up to leave. 3. We have lots of parking on the East Side of the building - right on 6th Street. If all else fails - and there isn't parking near our building, please feel free to park on the side streets. Note that the curb in front of the white building - notes NO STOPPING - so no parking either. Note there is a huge parking space in front of the offleash park as well just a block north of us right on 6th street! Please do not park in our neighbours Modern Niagara's road and driveway. We have comfy beds and couches here at Sleep Rover – however if you wish Rover to be kenneled at night, we have crates available to do just that! If you wish to bring their bed and blanket – that is an option. If not, we have some great comfy Molly Mutt & Bowser Beds for them, with the covers changed weekly! What is included in the daily and nightly rate? Our Daycare Rate covers the duration your dog is here during business hours. Our nightly rate covers drop off day of daycare day, and the overnight up till the next day. Although we are staffed 24/7 – we do not allow pick ups and drop offs outside of business hours for safety reasons and to not disturb our sleeping clients. Our office is open Monday through to Friday, 6am to 9pm (as of January 1st, 2016) and Weekend & Holidays, 7am to 7pm. PLEASE NOTE WE DO NOT book DAYCARES during Long Weekends on the Friday till Monday. We are staffed 24/7 – so do not hesitate to contact us. Our Hours of Operation are when you are able to browse the boutique and check in and out your dogs. Please do note that we are closed every year on Dec 25th, 26th & January 1st. What is a typical day at Sleep Rover? Checkins start at around 6am to 11am! During this time, our room of clients get rotated inside. We also play with them - and if we are lucky and noone is toy aggressive, we play fetch! Between 10am to 11am - we start our journal entries. These can be found on our GINGR report cards - and we give each client a quick brief update of Rover's day. Any detailed inquiries may be directed via email. By noon, most of our clients are quite tired, and nap themselves. No we do not kennel any of our clients, unless lunch is requested. Most of the time, our caregivers eat lunch with them! As 1pm rolls around - we go about another rotation to play with the dogs outside and inside, but as dogs usually rest more, we spend more time massaging and hugging the clients by the afternoon. As we start feeding our clients for dinner, the caregivers also start cleaning the facility for the night. How about giving my dog their medicine? Sure! Sleep Rover caregivers are educated on most medications and we do not charge any administrative fee – because we care! How will I know how Rover Is Doing While I am AWAY? With our new GINGR program - we are able to update you every day that Rover stays with us (where as before, we use to hand write feeding notes and journal entries). You may check on this at night while you are on vacation! You can also check photos of Rover every day. We upload photos every night of our day with our clients on Facebook under "Sleep Rover Doggie Hotel & Daycare". You are also free to call and email!! If you have any further questions, please do not hesitate to contact us at info@sleeprover.ca!